As they say, better late than never! Representative Cinta Kaipat and young environmentalist David Hosono, Jr. at the Flame Tree Arts Festival. David attends Oleai Elementary School, the same school Rep. Kaipat attended in 6th and 7th grade. 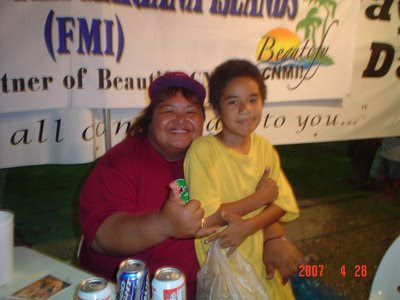 David was spotted making several trips to the Beautify CNMI! booth to recycle their trash. Way to go, David! Good Job!! !